Some might call it - even - Shamanic. Zen is not older than god. Your Taoist big Sumi brush poetic approach strikes me as antithetical to your audience. Personally I am confused as to where you are heading with these glib Zen links and its relevance to Shamanism in contemporary Archeology? I read all your posts and I only get your intent on the second or third read,.... and I'm a big fan of boats, hematite AND Taoism. This crowd strikes me as more provincial. woodrabbit wrote: John.....so many threads? Look backwards. To fire hardened Chinese scapulae, among other things. 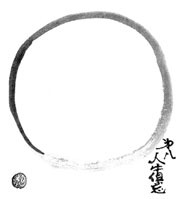 The ultimate lack of self is characteristic of the Shamanic, and, far later, Zen. Unless there is a reverse time machine involved here, I'd say that the Zen folks learned from the Shamans. Are you saying that the ten oxherding pictures are "glib"? They sure as hell aren't glib to me. John.....regarding the 10 Ox herding pictures being glib,... surely not, just the quick link in the current context.